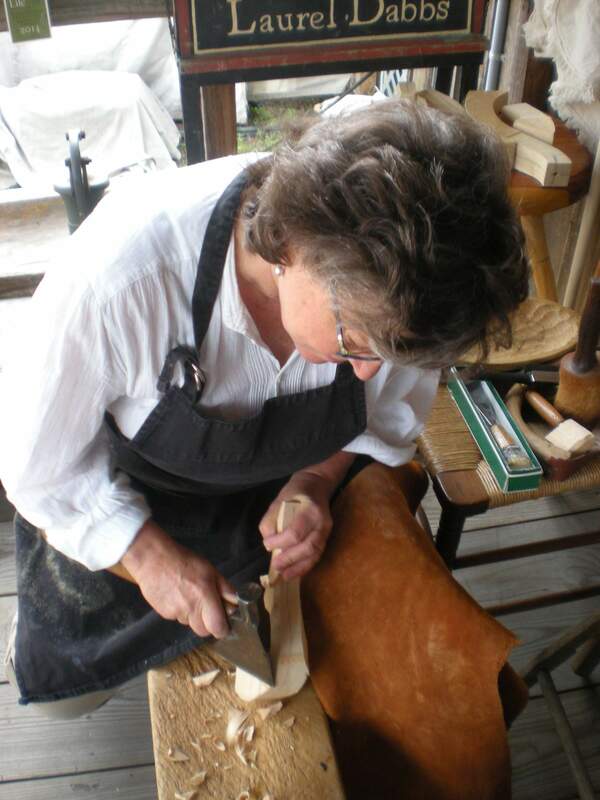 Laurel Dabbs will be one of the great artisans at the Zoar Harvest Festival. 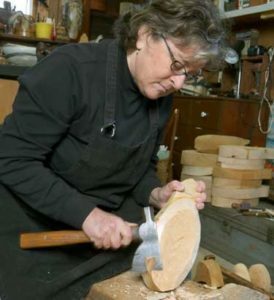 You can see Laurel and over 40 artists at the Artisans Tent at Zoar. Crudely fashioned or exquisitely detailed, decoys provided a means of luring migratory waterfowl close enough to be an important staple in the diet of the Colonists, whose early years were harsh before crops became established. Native Indians provided the knowledge and skills of using decoys made of wood, reeds, mud and feathers. My gunning decoys start as eight-foot planks of white cedar, winter-cut and air-dried at least two years. Using a hatchet, mallet and gouge, spokeshave and carving knife, the doweled (for strength) head gets attached to the hollowed-out body. Durable house paint assures a sturdy finish that stands up to the rigors of field use, and inletted lead makes sure the decoy self-rights in choppy water or sits nicely on a mantel. Each decoy must be seaworthy and durable as well as beautiful. I first started in a class on decorative bird carving taught by Jim and Joan Seibert at the Wetlands Institute in Stone Harbor, New Jersey. A trip to J.P. “Jamie” Hand’s Goshen workshop to purchase a knife found me taking his class in gunning decoys concurrently. I enjoyed both immensely, but the history and sculptural simplicity of the working decoys became my main passion. The fact that they were not only beautiful, but useful as well really struck a chord. A gifted decoy carver, hunter’s guide and colonial-era restoration carpenter whose family has lived and hunted in Cape May County for over 300 years, Hand’s dedication to traditional tools and techniques, along with his eye for elegant simplicity, make him the very best of the Barnegat Bay- style carvers. His talent and influence continue to inspire me to this day. I am lucky to have been able to carve my New Jersey decoys in Connecticut, Hawai’i, and Florida, courtesy of the U.S. Navy and in Ohio, where I now live. Each September always finds me back at the Ocean County Decoy and Gunning show, in Tuckerton, to buy wood and not stray too far away from traditional New Jersey style. It’s a delicate, prettier style than many decoys from other regions and I try to stay true to that.